August 15, 2012 - The Federal Aviation Administration (FAA) The Federal Aviation Administration (FAA) has completed an aeronautical study (Aeronautical Study No. 2012-WTE-322-OE) on the Nantucket Sound wind turbines and has determined that the proposed construction of the 130 wind turbines, individually and as a group, has no effect on aeronautical operations. As a condition to this Determination, the structures must not exceed 440 feet, marking and lighting, white paint and synchronized red lights. (FAA Advisory circular 70/7460-1). Therefore, the FAA concludes that the project, if constructed as proposed, poses no hazard to air navigation and on Wednesday issued a “Does Not Exceed (DNE)” determination for the proposed construction. The FAA makes obstruction evaluations based on safety considerations and the available solutions to mitigate potential risks. The Cape Wind Project is an offshore wind farm on Horseshoe Shoal in Nantucket Sound off Cape Cod, Massachusetts. The project is proposed by a private developer Cape Wind Associates, the brainchild of Jim Gordon and a joint business venture between Energy Management Inc. and Wind Management LLP. 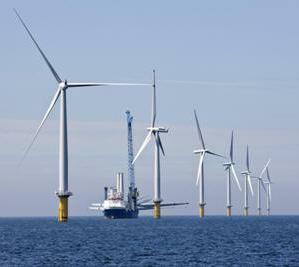 The wind farm may become the first offshore wind energy project in United States coastal waters. Great controversy has surrounded the project. The project has been fought by the Alliance to Protect Nantucket Sound, formed in 2001 to oppose the proposal because it will construct 400-foot tall wind turbines in the middle of environmentally sensitive Nantucket Sound. The project is expected to cost $2.5 billion. The FAA cleared the construction of the wind farm on May 17, 2010 after raising concerns that the windmills could cause interference with radar system at nearby Otis Air Force Base. Cape Wind agreed to fix the base's current system to ensure that it would not be affected by the wind farm. In Summer 2011, the Wampanoag Tribe of Gay Head (Aquinnah) filed a lawsuit against the federal government for allowing Cape Wind to move forward. On 28 October 2011, the U.S. Court of Appeals for the District of Columbia rejected the Federal Aviation Administration's ruling that the Cape Wind project's turbines present 'no hazard' to aviation. The court ordered the 'no hazard' determinations vacated and remanded back to the FAA.